I just got back from 4 days in beautiful Montreal, Quebec, Canada. 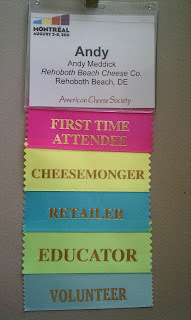 I was the sole attendee from Delaware attending the American Cheese Society 2011 Awards and Conference. While it's good to be first, ultimately it's not good to be the only! Another slightly embarrassing fact - there are only two (count us!) members of the American Cheese Society from Delaware. Delaware Economic Development Office, Delaware Department of Agriculture, and, Delaware Department of Tourism, pay attention! Readers - did you know membership (and conference attendance) is open not just to cheese/specialty food professionals, but also to the general public? The membership fees are very reasonable, and if you're a fan of good cheese/authentic foods, please join ACS. More of that in another blog posting. Anyways, since I've gotten back I'm busy catching up with orders, e-mails, 'phone calls to return, deadlines, a website upgrade and performance tuning project, and the August board meeting of Slow Food Delmarva. Also I have a project getting of the ground to raise seed monies and operating capital for our new retail storefront, financial markets are in a panicked free fall, our eldest dog is sick, and spouse is running for Mayor of our town - Rehoboth Beach. Elections are this Saturday, August 13 - please come out and vote to Change The Tone, Vote McGlone! It's a busy time, to say the least! While I'm still absorbing this wonderful conference (check out my flair - to the right! ), and how I can translate my experiences there to support a cheese industry on Delmarva, I wanted to post a quick, informal overview of the Top Ten Things I Learned at ACS Awards and Conference 2011. I'll post a more serious summary of my conference experience later in the week. With the turmoil in the financial worlds this week, we all need a touch of levity. So, step away from the 401K statement, grab a chunk of cheese, a beverage of choice, and read on! Drum roll please! Clear throat, you're on! 10. Pepsin spoken with a French accent sounds confusingly like Pepsi. 9. Cheese makers are a really fun, cool bunch! Thanks for hanging with us cheese mongers, retailers, suppliers, distributors/wholesalers, educators, and caseophiles. We would not be here without you. 7. 17,000lbs of cheese were used at the conference. 6. It is possible to eat one’s body weight in cheese in 4 days! I implemented my own round of Quantitative Cheesing! 5. 1,676 North American Cheeses were submitted for judging, plus cultured milk products, taking two days to process Canadian customs and government inspection. My hands and jaw are still aching from all the clapping and broad grinning at the awards ceremony. 4. Flocculation can be discussed in front of one’s grandmother, for floc's sake! 3. Cleavage is finally of interest to me! 2. Quebec, Ontario, and Wisconsin. I’m sorry - I had no idea the variety of your artisanal cheeses. You have my respect forever. Quebec, Ontario, et Wisconsin. je suis désolé - je n'ai eu aucune idée la variété de vos fromages artisanaux. Vous avez mon respect pour toujours. 1. ACS – what a great organization blessed with dedicated people working hard on our behalf. Your membership fee and conference fees are a really good deal! Please join ACS and get involved on a volunteer basis. You have no idea what it takes to get heritage and artisanal foods on our plates! C'est ça! Au revoir! A bientôt!